Please enter you name on the notice board list if you are able to help. All that is required is a once a month clean taking about 2 hours. Thur 4th April Waipuna Hospital Drive. See details. Mon 8th April Club meeting night. Speaker - Rod Brayshaw Wed 10th April Mid week run. Organiser Smylies. No details available. Sat 20th April Tauranga Jazz Festival and car parade. See details Tue 23rd April Noggin and Natter - Tauranga Citz Club Fri 26th April Club Movie Night - Reach for the Sky. Sun 28th April End of the month run. No details available. Mon 29th April Committee meeting Thursday 4 April 10am – Noon - Waipuna Annual Morning Tea Run Annual Morning Outing – for a number of years our Club has provided up to 12 cars and their drivers to assist with taking the Hospice Day Patients on a short country drive to arrive at the The Quarry, Te Puna for a morning tea provided by Hospice. The organizer, Sue Walsh has asked if our club members could assist them again this year. 2019 Tauranga National Jazz Festival Easter Vintage Parade Date for the Parade – Saturday 20 April. Time commitment for members 11am – 1pm Meet at Clubrooms 10am The Parade would start at our Clubrooms, and be lead by a band travelling from Cliff Road down Willow Street, to park up along Willow Street, between Wharf and Spring Street. A great deal has been offered for our members - All volunteers from our Club that participate in the Parade will be offered double concert tickets to one of the concerts at Baycourt theatre! Contact people for this Parade - Mandy Ryan and Doug Brown PLEASE NOTE Drivers would be required to leave their autos parked up for public display until 1pm Doug Brown, Ph 021 668117 or 07 5490617 is the BOP VCC contact person, and members are to contact Mandy Ryan direct with regards to ordering their FREE concert tickets. Please Welcome New Members Ivan Shannon Ivan has a 1952 Vincent Rapide M/c Shane Goldthorpe Shane has a 1967 Pontiac Firebird Coupe Welcome to the Bay of Plenty Vintage Car Club. Please make yourselves known to other members and also please wear your name badges at all events. This will also assist other members to get to know you better and please, do not hesitate to ask somebody for help should you require it. Well, here we are members, almost a quarter of the way through a very busy 2019. I can tell you it's only going to get busier going forward for our Club, due to the number of goings-on in the world of the VCC. My contribution to this month’s edition will be slightly shorter than usual, due to my temporarily blurred vision, however, I will endeavor to inform you of all the exciting comings and goings on around the ‘traps’ for the month of April. April 4 – is the annual Waipuna Hospice Drive, when several of our members volunteer two hours of their time to take the Hospice Day Patients on a short country excursion to then arrive at their destination, Te Puna Quarry Pavillion, for a prepared morning tea supplied by the ladies of the Hospice for both the patients and the drivers. You may recall recently through the weekly Buzz I did ask if I could please have 12-15 volunteers. At the time of writing this column I have received confirmation from SEVEN members that they are able to assist, many thanks guys much appreciated. However I would really love a few more volunteers, if you are able to help, can you PLEASE contact me ASAP. April 8 – Club Night and our guest speaker for the night will be the VCC Registrar Rod Brayshaw. Rod will be speaking about his 50 years in restoration, and all his diverse experiences with not only classic and vintage autos but several of the owners of these autos, including ‘Mr. Asia’…come along and find out more, as on this occasion my lips are sealed. April 15 – 19 woohoo it’s Easter… chocolate eggs and hot cross bun time… More importantly though, is several of our members who are the proud owners of Classic Model A’s (including us,) will be all firing up our ‘A’ engines to head in the direction of the South Island for our pilgrimage to yet another National Model A Rally, this time being held in Te Anau. This event is guaranteed to make Easter a memorable one for us many members, swapping ‘A’ yarns, indulging in the odd wine or two, and telling a few yarns (lies) on the way and of course the indulgence of the odd Easter egg or two and hot cross bun. Here at home base at Easter weekend in Tauranga the city will be in full swing with the National Jazz Festival. This year members from our Club have been invited to be part of the Jazz Festival Parade and drive their Vintage/Classic cars in the Parade. The Parade will be happening on Saturday 20 April from 11am – 1pm. If you would like to be part of the fun your contact person is committee member Doug Brown. Doug is extremely keen to have as many members as possible to join him and Linda to lead the Parade from our club rooms to travel down Willow Street and park up in Downtown Tauranga for a few hours so the public can ‘oogle’ over your autos. As well, members, an extra bonus has been offered, if you participate in the Parade, you will receive double concert tickets to attend one of the several concerts of your choice being held over the weekend at ‘Baycourt Theatre.’ (Please see advert) April 19 -22 and straight after Easter, is the National South Island Easter Rally, this year being held in Ashburton. I know part of the North Island group traveling down to the Rally are BOP members, the Goldsmiths, the Fenns and the Fails to name just a hand-full of folks. April 26 - 28 the ‘Maunga-Moana Rally’ will be taking place in Taranaki. Rob Thomson and his Rally Committee always turn on an excellent weekend, and once again an event many BOP members enter year after year because it is always firstclass. If you require an entry form please check out the Club notice board, go online, or give me a bell, I am happy to steer you in the right direction. The weekend spent in New Plymouth will also give you the opportunity to travel on excellent motoring roads the Naki has to offer, in preparation for our 2021 Vero International Festival of Motoring. Think seriously folks, about going to the 2021 Festival as it is going to be an event you won’t forget in hurry! Tony Haycock the Festival Director and his band of young merry gentlemen/and ladies (Festival Committee) are going all out to make this event exceptionally different from previous festivals. To quote Tony…”Don’t forget to mark 17 – 22 January 2021 on your calendar now. For one week, New Plymouth will become the centre of all things motoring for the 2021 Vero International Festival of Historic Motoring. 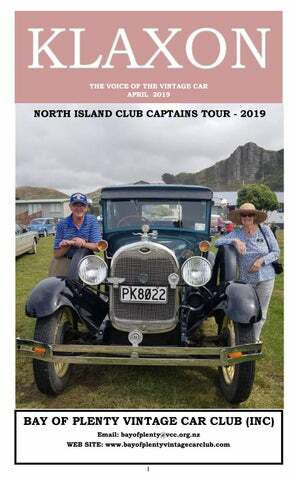 Bring your car, truck or motorcycle and join the fun – you won’t have seen anything like this!” Last month, as you know, was another VCC National event, the 2019 North Island Club Captains Tour. An event that many BOP members went on. Whilst the Smylies were ‘missing in action,’ all the incredible reports I have received to date from every member that went on the Tour telling how much they enjoyed it, has been awesome. I have to confess how disappointed I was after the many months of plotting and planning this Tour, Jim and I didn’t get the opportunity to enjoy with the dozens of entrants all the wonderful motoring on roads very rarely traveled on, was to say at the least, gut wrenching. However, the old proverbial saying, “every cloud has a silver lining” in my case couldn’t have been truer. My silver lining and knight in shining armor who came to my rescue on the eleventh hour to take control of the Tour was past North Island Club Captain John Foot and his lovely wife Shirley. Jim and I can’t thank the Foots enough for all their tremendous support and help. From the numerous phone calls, text messages, photos, and emails I received several times a day from either John, President Diane or the entrants, Jim and I felt at times like we were part of the big picture! At our April club night, I will give you a short presentation about the Tour, and share with you a few of the many photos I received, and furthermore show you an excellent video taken on the Tour by members Stephen and Janice Belcher. I am signing off now folks for another month, please keep your peepers tuned online to your INBOX for reminders in the weekly Buzz of events coming up. If you don’t receive the Buzz but would like to, don’t forget just send me an email and I will add you to my list of recipients. Until May, safe motoring everyone over the Easter break in your Classic autos! Hi Everyone, What a busy month March was for many of us. Probably the most notable event would have been Kaarens North Island Club Captains tour. We did the first leg to Rotorua where the Rotorua VCC made us very welcome. At that point we left the tour which headed off to see the Huka Falls then onto Taupo for a rally to be held over that weekend. Luckily for us we did venture back home straight away as the next morning I noticed a puddle of oil under the car and further inspection revealed the slave cylinder for the clutch had leaked all its fluid out, so no clutch. Then the fun started. I approached 5 local businesses for replacement parts and not one of them could do anything more than just look at their computer and say don’t know. One business only suggested another supplier in Hamilton. It seems in my mind they were just too lazy to look in a book cross referencing to parts and suppliers. They all complain that they are sick of our members sourcing parts elsewhere but that is the situation they have forced us into. I got onto the web myself and within an hour had found a site in Auckland, got a reply from them and ordered complete new assemblies at a very reasonable price. The parts arrived within 24 hours and were spot on. This is the second time this has happened to me. The previous time was a much more modern car. I want to deal local and support the businesses but they need to brush up their acts and be more interactive with other suppliers that provide parts. At our last meeting a letter from Rod Brayshaw about our name change, was put on screen to read. It seems there may be a softening in opposition towards this subject. That’s the way I took it anyway. However I did note he thinks it may be better to leave the name as is and publicize the fact that we will accept Classic Cars. This I do disagree with. Who is going to see that fact if a person is not looking at our details because the name of the club refers to Vintage only and they to have classic. They will obviously go to a Classic Car Club first. WE NEED THE NAME CLASSIC IN OUR NAME to attract the first enquiry, not to be found out about later on. Also as we get nearer to our AGM we need to start thinking of our office bearers. A few are due to retire this year for various reasons and we need some fresh thinking. A bit of thought needs to be generated and people approached now rather than at the last minute. I am sure there are members out there who wouldn't mind taking on a task but if they are approached at the last minute will probably decline. But with a little nurturing will accept a position and later maybe even thank you. It is rewarding to be involved in the running of your club. Still after a lot of appeals for information for the Klaxon, they have fallen on deaf ears. I also heard from another person the same complaint about the same matter with the same result. I told him. “JOIN THE CLUB”. Now he knows how I feel. The membership wants to read about trips away and other items of interest but expect others to provide it. I APPEAL TO YOU ALL!!!!. IF YOU HAVE DONE SOMETHING INTERESTING THEN PLEASE TELL US ABOUT IT. “THANK YOU”. DON’T LEAVE IT TO ANOTHER PERSON. All for now, Paul All articles must be in writing and received PREFERABLY early in the month, the close off date being Wednesday following the committee meeting. Westpac Bank a/c 030435 0492753 00 Please use your name as reference. As we are trying to keep things simple - no copies will be available at the front table on meeting night. All hard copy magazines will be posted. Note: It is not the intention to stop printing Klaxon, but to recover the cost of printing it. Regrettably the change has been made necessary due to increase of printing and mailing costs and the extended delivery times we now face. Klaxon will still be free of charge to all members who receive it on Email. Not receiving Klaxon by email !! If you are not receiving Klaxon by email the probable reason is we do not have your correct email address. Please send an email to klaxoninfo@gmail.com so the correct address can be copied. Another reason is possibly your security setting is set too high but please check the above reason first. KLAXON 1959 Reproduced by Paul Beck A Vision in Blue by Tony James My wife has been on to me for some time to buy her a small car and at last the day actually dawned when I decided that I had enough money to buy. That is my wife found out that there was enough money in Kitty for HER CAR. And of course there was nothing else for it. “Cheerio. Good bye dear. I’ll come back with something for you.” “As long as it’s not too old,” she said. And at this juncture the reader must allow a space of 3 days, during which time a business trip took me around the North Island, a trip during which the VCC bug bit me in no uncertain manner. I feel sure that it was first in Wanganui that I first contracted this disease for it was in this town that I first began to reason that “my dear little wife just would not be safe in any of this modern Tinware” and that the only thing to do was to purchase something really solid and the only solid machinery on the market was pre 1930. For many years I have provided a Cloud site provided by Google Drive. I have been notified by Google that this may possibly be discontinued due to modifications to their policy. What this means is that the site may no longer be supported so will no longer work. I have used this site to store and provide other Club Magazines and made them available to our Members. The days of this site has reached its usefulness in providing information for many years which is now readily available on other Club Websites and also at the Head Office website. â&#x20AC;&#x153;It has done its jobâ&#x20AC;?. Many clubs though send their magazines to me which I can forward to you as they arrive, all or some, to any of our members if you wish. Send a request to me at klaxoninfo@gmail.com for which magazines you require. BOP VCC LIBRARY Contact: Yvonne 07 5748482 We are accepting good clean car service manuals or books that relate to automobile history or travel for our club library. Klaxon: Klaxon is available on email. If you are not receiving Klaxon by email then we do not have your email address. To correct this send an email to: klaxoninfo@gmail.com From there I can copy and add your email address to your contact details Klaxon Posting: Klaxon is emailed to all available email addresses free of charge. A hard copy may be obtained by posting $30 annually to PO Box 660 Tauranga 3144 or by direct credit to Westpac Bank account 030435 0492753 00. Use your name as reference in both cases. BOP VCC Facebook: The club has a Facebook page which is now public allowing others to contribute. 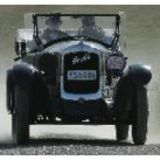 If you wish to be friended to the page, Send request to: Kaaren@smylie.co.nz BOP VCC Website: Search bay of plenty vintage car club in your browser. The site contains our magazine and other information of interest pertaining to our club. It also contains a link to enable the general public to send messages to the Club. IMPORTANT NOTICE TO ALL MEMBERS WHO DIRECT CREDIT HEAD OFFICE HAVE RECEIVED SEVERAL PAYMENTS OVER THE LAST TWO MONTHS WITH FAULTY REFERENCES. PLEASE ONLY USE YOUR MEMBERSHIP NUMBER OR FULL NAME. PLEASE CHECK YOUR BANK STATEMENTS AND SHOULD YOUR REFERENCE BE ANYTHING OTHER THAN THAT, PLEASE CONTACT HEAD OFFICE URGENTLY. Your connected accountants At Walton Railton we understand you have goals and we are passionate about using our knowledge to help you reach them 415 Cameron Road (Cnr Eighth Ave & Cameron Rd).